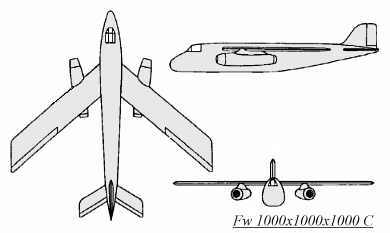 This third design of Focke-Wulf for the 1000x1000x1000 bomber was similar to the first design. The wings and tailplane were of parallel chord and the fuselage was deepened. The two HeS 011 jet engines were on underwing pylons to increase the mass-balance effect. They were also turned out of line to help enhance single engine controllability. A crew of three was positioned in a forward cockpit, and 1000 kg (2200 lbs) of bombs was to be carried.